Though he had to leave for London last night (there was a fire at his ice cream parlour), I am greatly indebted to Fela for inviting me to see his homeland. I didn't get to spend as much time with him as I would have liked, but I understand how busy he is. Between his activism and his music, I am stunned to see that he is able to smoke that much marijuana or bed even half the number of women he does in a day. Even in his absence, I feel that he is my guide in Lagos. I have found that once the locals hear me mention "my good friend, Fela Kuti" they treat me with reverence that my physical presence alone can not explain. 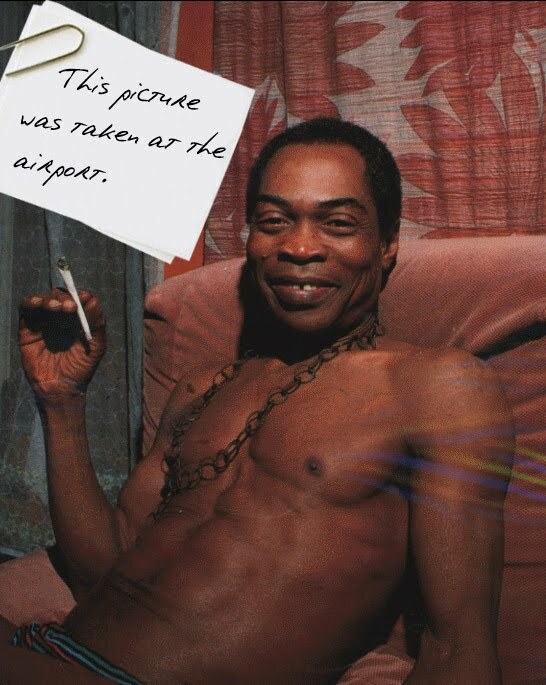 I think they also appreciate that I have adopted Fela's habit of wearing bikini underpants as my only item of clothing. I find it suits both the weather and my personality. Being faced with another week to explore Nigeria more or less on my own, I decided to concentrate on the conurbation that had sprung up in the wake of the oil boom. I had initially wished to see some of the country's mega fauna, and was disappointed to find out that the recent influx of money had removed most of the "flashier" species to new homes in the city. Newly minted oil magnates decorated their Western style apartments with live leopards, and it is not uncommon to see a sad, sedated hippo working as a casino greeter. Of course my instincts told me to free these beautiful animals, but my role as a Western foreigner, and the troubling paternalistic connotation that would taint any intervention on my part, gave me pause. If Africa is ever going to shake its reputation as "the lost continent" it will have to do so on its own. Europeans with good ideas are more dangerous to Africans than a lion with a gun that shoots tsetse flies. Even in the rare occasion that intentions are good, everyone gets hurt. I know this all too well. My father was a brilliant man, whose desire to help the world rivals my own, and it lead to his greatest folly: "AfricaLand." A lot has been written about the foolishness of building a 1.2 million square mile theme park in central Africa, and I can't add anything that will vindicate the project except that he really meant well, and until his death he regretted causing those droughts. Anyway, I am finding Lagos to be an exciting metropolis full of interesting meats and vibrant nightspots. The warmth of the people astounds me. It is possible that I have misunderstood the currency exchange rate and am massively overpaying for everything, but I choose not to be cynical. I have purchased an incredible array of patterned and batik-ed fabrics and I think I will use them to create uniforms for the youth baseball league that I am sponsoring.